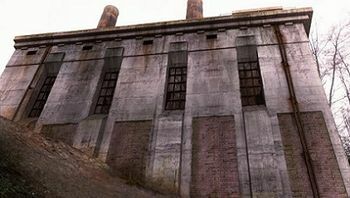 When the Men of Letters were destroyed by Abaddon in 1958, the Bunker was abandoned. 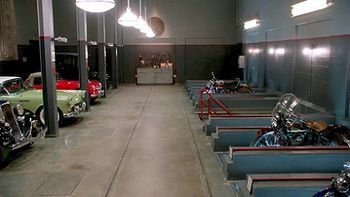 However, after learning of its existence in 2013, Sam and Dean Winchester moved in and made the Bunker their home. There are large wooden tables in the library. At the end of 12.18 The Memory Remains, Sam and Dean sit in the library wondering what their legacy will be a hundred years from now. Sam suggests the people they saved will be their legacy, because they left the world better than they found it. Dean wonders about the bunker, if other hunters will move in. Dean gets out his knife and he and Sam carve their initials into the library table as they had done in the Impala (as see 5.22 Swan Song). The final shot of the episode shows Mary Winchester's initials alongside the initials Sam and Dean engraved. The staircase was originally used in Crowley's torture chamber in Season 7. 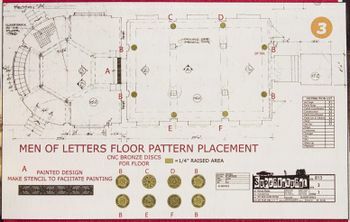 The devil's trap used in the dungeon was previously used in Bobby's Panic Room in Seasons 4-6. Sam and Castiel are trying to restrain Dean after he has attacked and slashed Gadreel. They lock him in the dungeon, Dean argues he is the only one who can kill Metatron, but Sam warns that the Mark of Cain is affecting him. Sam and Castiel leave, locking Dean inside. 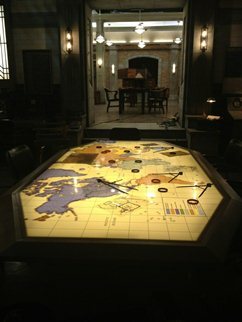 In the Bunker, Dean is throwing up blood. He manages to find the ingredients for a spell, and summons Crowley who reveals he needs to keep killing to feed the Mark, otherwise he will die. After Dean is killed by Metatron, Sam brings his body back to the Bunker, laying it in Dean's room as he goes to summon Crowley to "fix" Dean. Crowley, however, enters Dean's room and begins telling him of the power the Mark truly holds, after placing the First Blade in Dean's hand, Dean's eyes open, revealing black demonic eyes. Once getting Rowena to agree to help, Sam takes her to the Bunker's dungeon to work on decoding the Book of the Damned in order to find a way to safely open Lucifer's Cage and talk to him. Sam calls Dean who is investigating an attack on a church by Amara and lets him know that the Book of the Damned definitely has what they are looking for though they're still trying to find it. The two discuss Dean's case and after Sam hangs up, Rowena comments on his lack of trust in her despite the Winchesters telling her that they were partners in their war against Amara. Sam reminds Rowena that she has the Book of the Damned and the means to read every word of it so he's not taking the chance of letting her go free with that. Moments after they finish their conversation, Rowena finds the spell they need and tells Sam to call Crowley and that she will need some ingredients for it. Sam calls Dean but is unable to reach him due to Dean seeing Amara face-to-face. While Sam initially wants to wait for Dean, Rowena convinces him to go ahead with the plan without him and they depart the Bunker for Hell. Dean later returns to the Bunker to get gold blades to kill the banshee that is attacking the people at the Oak Park retirement home. There Dean finds Lucifer looking for a spell to draw Amara out and, believing him to be Castiel, admits that he had two shots at Amara and failed to kill her. As Dean gathers three gold blades, he tells Lucifer the story of his encounters with Amara and admits to having an attraction to her. Lucifer is intrigued and tells Dean the attraction between him and Amara could be a good thing and could help draw Amara out. Dean then gets a call from Sam and checks the Men of Letters records for Edward Durban II and finds him as part of a Men of Letters delegation that was sent to Europe. After going over their plan for killing the Banshee, Dean leaves, making Lucifer promise not to tell anyone what they had talked about. With the influx of refugees from Apocalypse World, the Bunker has become a way station for those who go out on hunts, with Sam delegating tasks to various hunters.